5 Rabbit is a new brewery in Chicago, or more accurately, a cerveceria depending where you look. Claiming to be “the first Latin microbrew in the US,” 5 Rabbit is pushing their connection to Latin culture as much as their unique brewing perspective. Founders Isaac Showaki and Andres Araya, both marketing consultants who met in Mexico City, recently launched their brewery with a tasting at the National Museum of Mexican Art in Pilsen, along with Randy Mosher, a Chicagoan who wrote the 5 Rabbits recipes and designed the labels. It seems, like any good marketers, they know how to find the right help in areas where they have little expertise, and mostly passion. While the marketing spiel smartly points to Latin brewing influences more than it seems to actually draw from them, no one can argue with the popping flavors and quality of the beer. It’s an instant presence in the city right now. 5 Rabbit Golden Ale (Cerveza d’Oro) is a straight-forward competitor to a Bohemia — light, crisp, but with a little more bitterness and bite. Like any pale Mexican ale, this pairs perfectly with spicy foods. 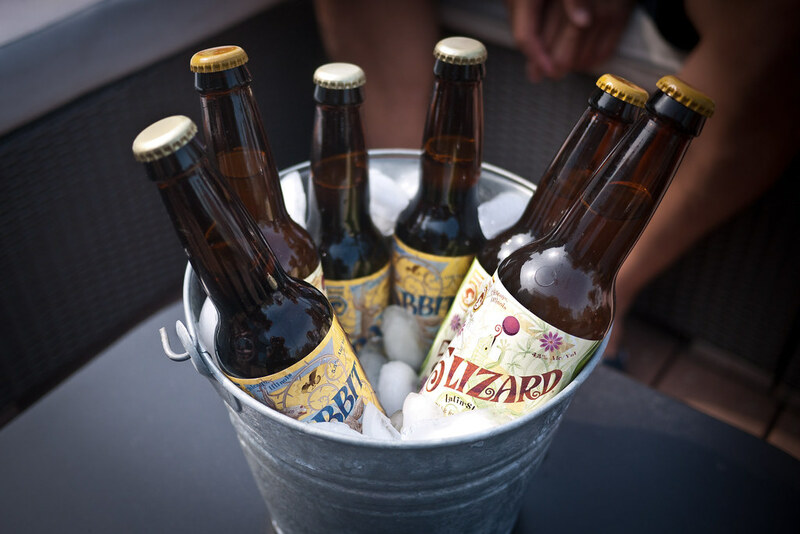 5 Lizard, a “latin-style witbier” is where this brewery starts to enter a world all its own. Brewed with coriander, lime and spices, this beer really hits the tip of your tongue. And it’ll grab you at the end with its tart, passionfruit finish. According to the brewery, they recommend pairing this brew with ceviches, grilled shrimp and green tamales — and I think they’re dead on. Both of these beers seem constructed with great latin food pairings in mind, being both palate cleansers and spicy complements to a heated Mexican spread. It’ll be interesting to see how this cerveceria connects with Chicago’s various latin communities vs. the demanding craft brew culture, and where those worlds intersect vs depart. In any case, this is a unique and spirited entry into an explosion of new Chicago breweries with great offerings. Keep a look-out for their third release, 5 Vultures, a “Oaxacan-style dark ale” with piloncillo sugar and ancho chili, which will be a bit more rare until the fall. Supposedly it’s on tap at Delilah’s. Milwaukee's Summerfest and the "Big Gig"